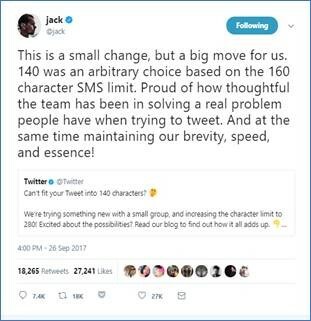 Last week Twitter began experimenting with doubling its 140-character limit for both mobile and desktop. As Mashable reports, the company is rolling out the feature slowly to a select group of accounts. Users in this group will be permitted to send tweets up to 280 characters at a time. The seemingly sudden change of heart is not so sudden. In July, Tech Crunch revealed the 11-year-old social media platform’s user growth has been on the decline, so Twitter has surely been feeling the pressure to adapt or die. How are Twitter users reacting to the change? Users (myself included) are clinging to the 140-character limit. It’s concise and keeps messages succinct and poignant. It also compels (most) users to consider the value of each word before blasting them off into the universe. Once you’ve included the relevant hashtags that make your tweet searchable, it can be challenging to keep within the 140-character limit. Still, the limit is a defining characteristic and a differentiator among competing social platforms. Of course, we must keep in mind people are inherently resistant to change. There was negative feedback when Facebook rolled out Facebook Live and when Instagram added the Stories feature. Now we can’t imagine a world without these features. Twitter said it made the change to not only give users more freedom to express themselves, but also to replicate the Twitter experience for every language. It’s going to be a significant adjustment for users, but that’s the nature of the medium. The social media landscape is constantly evolving, and every site will continue fighting to keep you scrolling through your newsfeed. Perhaps we’re not witnessing the death of Twitter, but rather its rebirth. As of now, Twitter has not said whether it will roll the change out to all users in the future, but either way, we’ll be watching (and tweeting) closely.